Last year, Hurrican Harvey devastated many the coastal areas of Texas and Louisanna, and caused over $125 billion in damages throughout the region. Many of the cities that were affected had no power or communication capabilities for several days, and coordinating emergency efforts during that time was difficult to say the least. 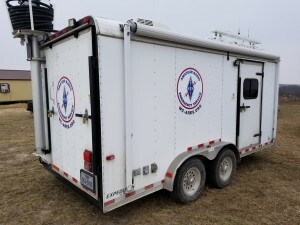 Williamson County Amateur Radio Emergency Services has recently purchased a communications trailer that can be used to do just that... coordinate emergency dispatching from a portable, self-contained vehicle. Our goal is to not only complete the installation of equipment required to make our trailer fully functional, but also purchase a small supply and repair trailer, as well as some tents, generators and other supplies that will allow us to run extended operations in affected communities as necessary. We are Texans serving Texans. Williamson County (Texas) Amateur Radio Emergency Services (WCARES) is a group of volunteers that provide emergency communications for local, county and state entities during times of crisis, as well as supports community events throughout the year. Greg has been with Williamson County ARES for two years as an Asst. Emergency Coordinator and Logistics Section Chief. Greg has a background in technical writing and infrastructure support.